Complain against an inaccurate invoice with this billing complaint letter. 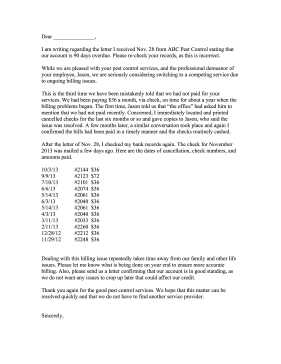 I am writing regarding the letter I received Nov. 28 from ABC Pest Control stating that our account is 90 days overdue. Please re-check your records, as this is incorrect. While we are pleased with your pest control services, and the professional demeanor of your employee, Jason, we are seriously considering switching to a competing service due to ongoing billing issues. This is the third time we have been mistakenly told that we had not paid for your services. We had been paying $36 a month, via check, on time for about a year when the billing problems began. The first time, Jason told us that "the office" had asked him to mention that we had not paid recently. Concerned, I immediately located and printed cancelled checks for the last six months or so and gave copies to Jason, who said the issue was resolved. A few months later, a similar conversation took place and again I confirmed the bills had been paid in a timely manner and the checks routinely cashed. After the letter of Nov. 28, I checked my bank records again. The check for November 2013 was mailed a few days ago. Here are the dates of cancellation, check numbers, and amounts paid. Dealing with this billing issue repeatedly takes time away from our family and other life issues. Please let me know what is being done on your end to ensure more accurate billing. Also, please send us a letter confirming that our account is in good standing, as we do not want any issues to crop up later that could affect our credit. Thank you again for the good pest control services. We hope that this matter can be resolved quickly and that we do not have to find another service provider.